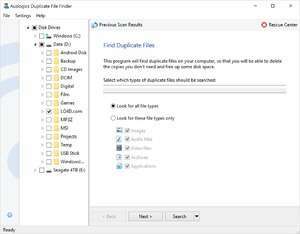 Duplicate File Finder (and we should add, deleter) is a freeware application developed by Auslogics and certainly one of the best freeware system cleaning applications featured on this site. Duplicate File Finder completes tasks which might otherwise take hours to complete were one doing them by hand with Windows Explorer. The idea of this program is while downloaded files on a system build up overtime, it's possible duplicate files get moved around from folder to folder and you end up with multiple copies hogging up disk space. Running this program will solve the problem of copies taking up space. Version 6.1.4 is a freeware program which does not have restrictions and it's free so it doesn't cost anything. For security reasons, you should also check out the Duplicate File Finder download at LO4D.com which includes virus and malware tests. Additional screenshots of this application download may be available, too. Duplicate File Finder has a presence on social networks.